It was still dark when Hana and I left our house a few Sundays ago to meet up with the St. Alban’s youth group. 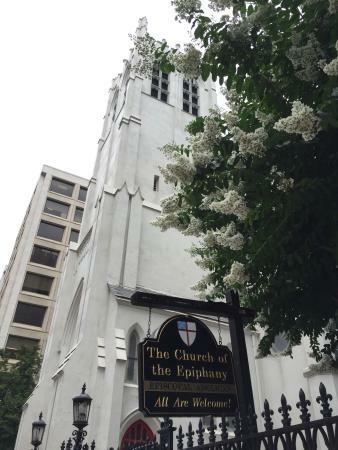 Our meeting location was the Church of the Epiphany, which is nestled among office buildings a few blocks from the White House and hosts the Welcome Table program. At 6:30 am, there were already folks in line to receive assigned numbers for breakfast. These early birds had to wait two more hours to eat, but at least they were guaranteed a warm meal. The deacon welcomed us and explained the Welcome Table’s mission, which included feeding the hungry and worshipping as one. In addition to breakfast and the Eucharist, we had the option of participating in several group activities: Gospel Art, Bible Study, or Choir Rehearsal. Most of the youth opted for Gospel Art and made use of the assortment of paper, paints, pencils, and markers. Hana was rather quiet and sat next to Marvin, who willingly broke away from his drawing to chat. Soon, though, she was conversing and coloring with the others. At another table, a man with a knitted hat worked on a vivid watercolor of the Washington Monument. During the Eucharist, the choir (which acquired two St. Albanites as choristers that morning) and the congregation sang music derived from the African-American hymnal. Many in the congregation asked for prayers relating to housing, addiction recovery, and hopes for entrepreneurship opportunities. We listened to a sermon on compassion and the importance of simple acts such as saying hello and good morning. I glanced at Hana, wondering if she was paying attention. We waited for our turn for breakfast, which consisted of a bowl of fruit, scrambled eggs, bacon, sausage, grits, biscuits, and jam. The volunteers were efficient with turnover to maximize the number of people being served. 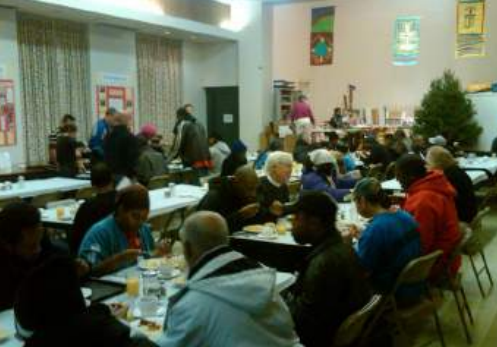 The church regularly prepares for 200 meals and it was evident that the demand was high. When we were done, we returned to the pews and listened as church volunteers continued to call out numbers for breakfast. Our visit concluded with the group members reflecting on their experience. Some noted the congregants’ active involvement during the entire church service. Those who participated in the Bible study admired the participants’ extensive knowledge of the Bible. Hana remained quiet during the reflection. I wondered if she just considered this as another activity on her schedule that I made her do. But later that day, Hana told me that it was a fun experience. Despite being a verbal child, she admitted the comfort of drawing and using art instead of words to express her thoughts. She enjoyed talking and listening to Marvin. She loved singing and clapping to the music and liked the idea of the open invitation to join the choir. Also, it turned out she did pay attention to the sermon. She appreciated how it offered practical advice on showing compassion to others, including strangers. She wanted to go back, despite the early morning start. Hana and her peers often desire to make a difference in the world. Acts of kindness and empathy have been cited as ways to fight bigotry and injustice. Grate Patrol and the Welcome Table are wonderful examples of love and faith put into action. At the Welcome Table, our youth were able to spend time and hold hands in prayer with those they may have served during Grate Patrol. They strengthened their listening skills and perhaps even learned from those individuals who were financially less fortunate, but still have much to offer. 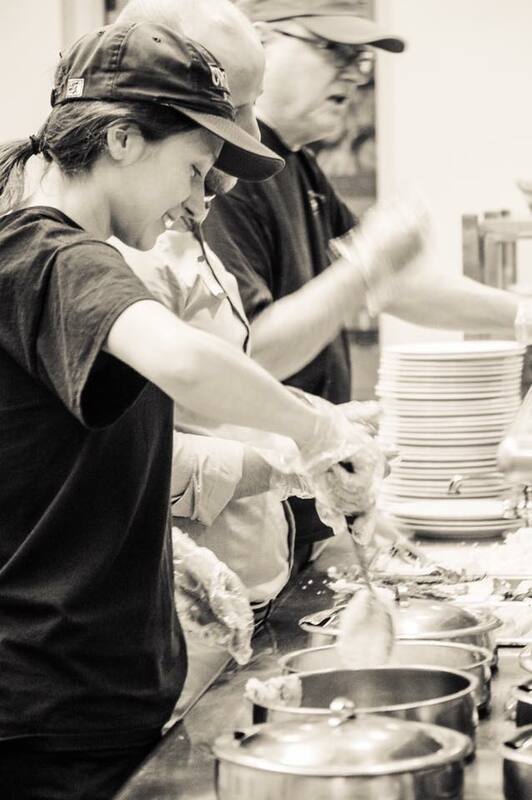 Our youth were also exposed to clergy, social workers, and volunteers dedicated to feeding the hungry, helping the needy, and serving Christ in these communities. As a parent, I saw firsthand the value of these hands-on experiences as part of the youth’s faith training. I encourage other parents and friends to join our youth and witness them sharing Christ’s love, sensitivity, and compassion.